(CNS): A number of local sponsors, CIFA and the sports ministry have partnered up to present a local football tournament next month for some of Cayman’s younger players. The inaugural C3 Cayman International Youth Football Tournament kicks off on Tuesday, 18 February with the Cayman Islands Select Team that performed admirably in the recent CONCACAF Under 15 Championships in August playing visiting teams from Swindon in the UK and Houston, Texas. The competition’s major sponsors are C3 Cayman’s latest local player in the communication industry with the provision of high speed internet, TV and phone. The Under 15 team from English League 1 outfit Swindon Town Football Club that previously toured the Cayman Islands in 2012 and 2013, and the Under 15 team from Major League Soccer’s Houston Dynamo from Houston, Texas will be the local boys’ opponents in the round robin competition. The youngsters from Swindon Town FC play the Cayman Islands Select Team on Tuesday, 18 February and the Houston Dynamo on Thursday, 20 February. 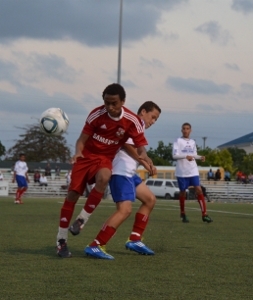 The final game of the competition will be the Cayman Islands Select Team versus the Houston Dynamo on 22 February. All games are scheduled for 7:00pm at the Annex Field in George Town and will be preceded by games featuring the best Under 14 and Under 13 Caymanian footballers. C3’s Managing Director, Randy Merren said the firm was proud to be the premier sponsors of tournament, which will not only promote local talent but give local players the opportunity to develop their skills against overseas competition. “We encourage everyone to come out and support the teams. Patrons will be given the opportunity to ‘kick to win’ during halftime of each game and have a chance to take home a flat screen television or tablet to enjoy C3’s digital TV service,” Merren said. In addition to the three games, coaches from the visiting teams will be conducting free camps for players and local coaches on the Monday, Wednesday and Friday from 4:00 p.m. to 6:00 p.m. at the Annex Field and Ed Bush Fields. The Under 15 team from Swindon Town FC features three prominent Caymanian youngsters – Sebastian Martinez, Kray Foster and Nathan Borde. Unfortunately for young Foster, an injury sustained in December will keep him out of the action but Sebastian Martinez who has been with Swindon Town’s Youth Academy since October 2011 will be in the line-up. Martinez’s contract which includes his education was made possible by Swindon Town FC’s talent scout and former Swindon Town player and Reggae Boy Fitzroy Simpson. Simpson’s recommendation to take Sebastian to Swindon Town FC was supported by the Cayman Islands Government and a collaborative effort between the then ministries of youth and sports, education and development, and his parents. Nathan Borde, who recently joined Swindon Town’s Youth Academy in August after spending time with Sheffield Wednesday’s Youth Academy, is there through the efforts of Simpson as well. The tournament will mark the first time that the Under 15 team from the Houston Dynamo has ventured south to the Cayman Islands. In October 2013, Sunset Football Club travelled to Houston with Under 13 and Under 15 teams and played practice matches against teams from the Dynamo’s Youth Academy. On this trip, Sunset FC will play host to the visitors from Texas. Tickets for the tournament are $25.00 for the three games or $10.00 per game and are available at the gate. In addition, children under 13 will be charged $1.00 at the gate with all proceeds from the event covering expenses for the visiting teams. For further information on the tournament and camps, please contact 925-3323 or e-mail grasspiecepromotions@gmail.com. Along with C3 the platinum sponsors other sponsors include Pepsi, Aquafina and the Ministry of Health, Sports, Youth and Culture, in association with the Cayman Islands Football Association, Sunset Football Club, and a number of other corporate sponsors.